Pulse Magazine Feature on Local Innovators. 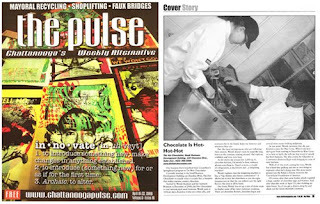 We were among several new Chattanooga business start-ups featured a few months back (April 16-22, 2009 Vol. 6 - Issue 16) in The Pulse. On its cover you'll notice some of Young Monster's posters; and on the inside, you'll find a photo of us working in the kitchen with an article describing our business. We've uploaded a pdf of this so you may download it to peruse it at your leisure. Click here for the article. If you need Adobe Reader, it's found here.